Yep, an attractive shoe. Not day street wear though. Unless you could use them as part of an elaborate fancy dress costume? It's the 'shiny' part of the style that would get noticed I think. If they were suede say, wearing them in a pub that wasn't empty, might be doable. Not sure about visits to the loo though? Shiny is good Freddy...... And I disagree with home only shoes, I have worn a similar pair from Next, around Westfield.... I was on my own at the time. I bought them, wore and returned them on the same visit... Bit naughty I know... 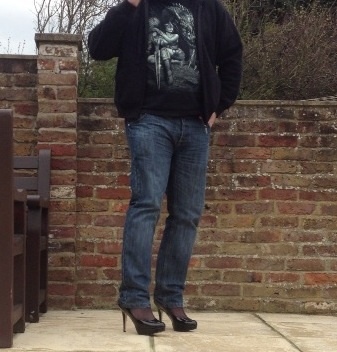 But they were a little too high; whereas the DP pair are far better to walk in! Don't forget to send us a link to the You Tube video of you out-and-about, when you find it. It didn't help the shoes weren't covered, I suppose. And it was during daylight hours ..... But doesn't come 'recommended'.